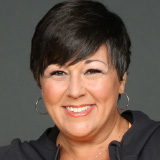 Our patient keynote speaker, Loriana Hernandez-Aldama, is an award-winning journalist with more than 20 years of on-air television experience, anchoring prime-time and morning news as well as reporting on a national and local level. Her mission has always been to make an impact on those around her, particularly through the transformational power of health. Loriana is also a cancer survivor. Loriana is the driving force behind a nationwide cancer patient movement called ArmorUp for LIFE. She will share her experience as a personal reminder of the importance to ArmorUp and take care of ourselves. She will also discuss the efforts she has underway to ensure cancer therapies continue to advance and that patients are able to keep up with treatment plans and return to life afterwards.